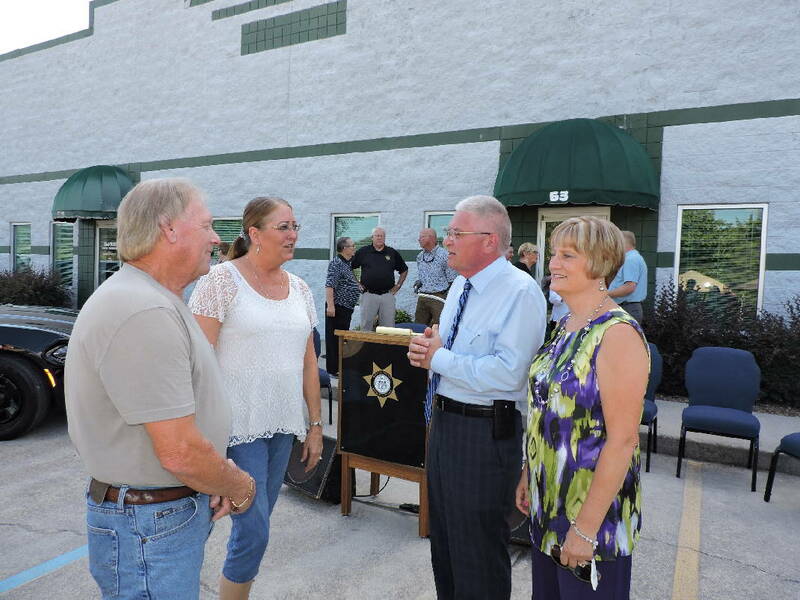 Clockwise from left, Mountain View Estates residents Robert and Debbie Blackwell speak with Walker County Sheriff Steve Wilson and his wife Sandy about how happy they are that the Walker County Sheriff's Satellite Office is finally open. Area residents are invited to join the Wilson Road Neighborhood Group. The next meeting is Thursday, Oct. 13 at New Covenant Baptist Church, 105 Spruce St. in Rossville. Visit WilsonRoadGroup.org to stay up-to-date and learn more. Another building sits unoccupied at the entrance to the city: Roy’s Grill. The popular nostalgic looking diner has had an on-again, off-again existence since 2010, when the Rossville Downtown Development Authority sold the building to a local father-son development team for $50,000. In 2011, they reopened the historic diner, which at one point was the first Krystal in Georgia, to a standing-room-only crowd. But six months later, they closed its doors. Shortly thereafter, it reopened under new management. With experience as the kitchen manager at Southern Star on Signal Mountain and a longtime employee at Merv’s Restaurant on Mountain Creek Road, John T. Arnold ran the restaurant until its closure again this summer. “Through the conversations we have had with the owners of the building, we know that they are committed to finding another operator for the facility and wish for it to keep the Roy’s Grill branding that has been a staple of Rossville in years past,” said Rossville DDA Board Chairman Keith Barclift. Six months after the Wilson Road Neighborhood Group began meeting to discuss increasing crime and decreasing property values, another stride was made last week when the Walker County Sheriff's Office opened a satellite location on Wilson Road. "It's a great day in the north end of the county," Sheriff Steve Wilson said to the large crowd that gathered for a press conference last Thursday. Though not the most visible sign of the progress made since March, when more than 100 residents began calling for change — numerous dilapidated buildings have been torn down due to their efforts — the new office could have an even bigger impact. "...Our No. 1 concern of this area was how to lower crime," said Debbie Blackwell, who lives in Mountain View Estates on Wilson Road. A burglary in the manufactured home community around the start of the year led owner David Roden to begin communicating with the Sheriff's Office about the need for change. In an email to Wilson, Roden told the sheriff people in the neighborhood felt unsafe and that county officials stood by idly while the community slipped into disrepair. Wilson said he wanted to help, and others in the community stepped forward. The residents partnered with Wilson, Deputy Bruce Coker, Walker County Schools Superintendent Damon Raines, Family Connection Coordinator Susan Wells and Chamber of Commerce President Lacey Wilson to discuss the issues and look for answers. Members of the group have shared ambitious visions, hoping for everything from more job opportunities to better diets for low-income children. But, Roden said, the meetings have shown two main concerns: crime and codes enforcement. With the new sheriff's office in place, the group can now fully turn its sights to the state of its surroundings. Roden doesn't understand why buildings slipped into disrepair and remained standing for years, and sees this as the next stage of the group's movement. Meanwhile, two miles away from Roden's Mountain View Estates, at the entrance to Rossville, the former La Dean Shop caves in more and more each time it rains. "I have people coming in from Birmingham, Atlanta and Knoxville that the first thing they see when they arrive is a caved-in building," said Andie Sellers, who owns Bettieville shop just down the street. "All it's doing is collecting water." Sellers also sits on Rossville's Downtown Development Authority Board, tasked with helping clean up the city's image and draw in visitors and businesses. She said the historical society told her the former hat shop is a landmark and can't be torn down by the city; it must be restored. "The La Dean Shop is considered a historic landmark," said Sellers. "The history buff guys said, 'Oh no, you can't tear this down,' so you know. [Rossville DDA Board Chairman] Keith Barclift advised us that a halt was put on demolition around the time when it caved in about four months ago." Barclift, who is also the project manager for the Northwest Georgia Joint Development Authority, said he is trying to find a solution, but "the DDA has limited funds and no funding source, so we currently do not have any plans to remedy the situation now." Rossville Mayor Teddy Harris said he believes the building's owner is in litigation with the insurance company. "The building is currently on with a Realtor and the DDA would be more than happy to work with any prospective buyer who is interested in redeveloping that lot," Barclift said. "We also are continuing to look for a private-sector solution to the issue." To longtime residents like Roden and Jim Hill, who is also active in the Wilson Road Neighborhood Group, the shell of a building could be just another sign of the times. Neither man has hard numbers, but they think Rossville's quality of life declined in the last two decades. People have abandoned homes. Businesses have closed. It feels like crime has become more prevalent. Wilson said he couldn't speak to that; his department has not researched crime trends for the area. Wilson said sheriff's deputies and detectives will use the new satellite office to meet victims and witnesses of crimes and as a command post during major events, including natural disasters such as heavy snowstorms and tornadoes. Warehouse space out back will allow the department to disburse food to those in need. "Knowing problems in this area and problems sometimes even in this business park, it's a win-win for the community and the business park," said Chris Carlton, who owns Ridgeland Business Park and is donating 800 square feet of its office space for the satellite sheriff's office. "Hopefully it grows to a permanent thing in the area and becomes manned full time over time." Staff writer Tyler Jett contributed to this story. Email Katie Ward at kward@timesfreepress.com.